While I was visiting Heb, James and little James Sinclair in The OC this past weekend, James Sinclair learned a hard lesson: sometimes life just isn't fair. Like when you try your very best to follow the "everybody be gentle" rule and your dog acts like it doesn't apply to him. That's really not so fair. One thing about me is that I take my birthdays pretty seriously. And by "seriously," I don't mean in the sense that the approach of October 18th launches me into a grave state of concern fueled by existential crisis and an unforgiving milestone-meeting evaluation. Not that these things aren't guaranteed to happen on an annual basis. (Lord knows I'm a sucker for a good existential crisis, which is fine...as long as I stay away from a certain book during said crisis.) What I did mean by "seriously," however, is that my birthday celebrations are no joke. As my friend Rob likes to say: "haaaayells naw." After last year's San Frantastic Tourist party and the prior year's Pumpkin Carving Olympics, I thought it might be well received if I introduced a nautical theme for 2009. You know, to take advantage of the very bay that inspired our fair city's enduring tag line: The City by the Bay. So out went the invitations for my "Let's Get Naughtycal!" party, a ferry excursion to the Hangar 1 vodka distillery in Alameda. Within minutes, messages came back with responses like "I'll shine up my seacock and meet you at the Pier" (eww) and "All aboard the S.S. Hot Mess!" The sun was shining for our big day at sea, which meant we didn't have to bundle up for the ferry--all the better for getting getting naughtycal (see above pic). As we sailed Eastward with a warm breeze blowing through our hair (and marine boas), we enjoyed several thermoses full of hot toddies (my favorite! Ahoy, Tim!). Note: looking back on this beverage selection, I'm realizing that the hot toddies served a dual purpose as both a delicious birthday treat and also a nutritious tonic to ward off scurvy as there were quite a few lemons in the mix. We made it successfully across the deep waters of the Golden Gate despite the fact that we were assaulted by fierce Somalian pirates along the way. Luckily, the pirates liked the sound of flavored vodka and wanted to join us for our day of tasting. Our motley crew, consisting not only of sailors and pirates, but also a large crawfish, a handful of swimmers and one Miami Beach glamor girl, disembarked at the Alameda port and began to make its way to the Hangar 1 distillery--on foot. Just then, a VW bus drove by and stopped dead in its tracks when it spotted us trudging along the side of the road. "You guys going to Hangar 1!?" the driver yelled to us. "Yes!!" we belted out in unison. "Well hop on in, friends. It's your lucky day!" she replied. A few minutes later, we were standing around her tasting table, sipping a "seasonally appropriate" spiced pear vodka. Ahoy! By the end of the several hour tasting, we had convinced the Hangar 1 employees to get naughtycal. And they were very quick to get their sea legs, which pleased us to no end. After a birthday picnic complete with anchor napkins (ahoy, Leah! ), a naughtycal stopover in a local park and an impromptu visit to a nearby tiki bar, our crew returned to the Alameda port, prepared to brave the waters yet again. Narrowly avoiding 2 buses full of pirates (not a joke--there had to have been at least 100 of them in full costume...waiting for a party boat to pick them up), we shoved off, headed due West for San Francisco. Despite a disorienting day with no compass in our possession (other than our moral compasses which weren't exactly pointing in the right direction), the S.S. Hot Mess docked at the Ferry Building and the voyage was deemed a naughtycal victory. 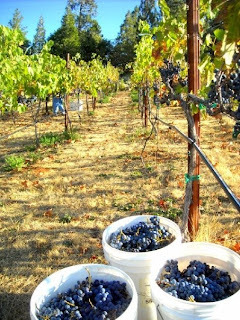 "It Takes a Lot of Beer To Make Good Wine"
It turns out that harvesting your own grapes is one of the best! things! ever! Not only do you get your own shiny little hook tool that looks like it should affix to the end of a pirate's fake metal hand, but you also get to dump your grapes from your personal collection buckets into a dump truck bed that empties into a grape crusher. Then you get to watch hard working boys shovel things while Larry and Dayle ride around in their tractor! The entire experience is a 4-year old boy's dream: pirates, tractors, shovels and crushing machinery. Someone could make a fortune with a childrens' book on the subject. Pop-up perhaps? Meanwhile, waking up at 6am to Dayle's farm-style breakfast kind of made me feel like Fern from Charlotte's Web (more along the lines of my 4-year-old dream). Though sadly, I was neither sporting cute overalls nor harboring a pet spider with magical weaving powers (note to self for next year). While we sipped our coffee, up came the sun, on went our wool hats and out went our crew of 15 into the fields, armed with shiny cutting hooks and a keg of beer. Kicking back later that night, it felt wholly satisfying to have a long day of real farm work under one's belt. (Somehow, completing a long day of interactive copywriting doesn't quite result in the same degree of "hells yeah!") And it felt even better to take off said belt and get in my favorite hot tub West of the Mississippi (complete with a blue disco light and a moonlit view of the Sierra Foothills).